Hiya guys! I'm so freaking excited about this week that I can barely contain myself. Not only is it Polish Pickup, but I'm on an actual real vacation. That's not all! I'm meeting an online friend I've known for eight years for the first time. I'll probably cry... Okay, I'll most definitely cry haha. I'm just so genuinely happy for the first time in a long time. 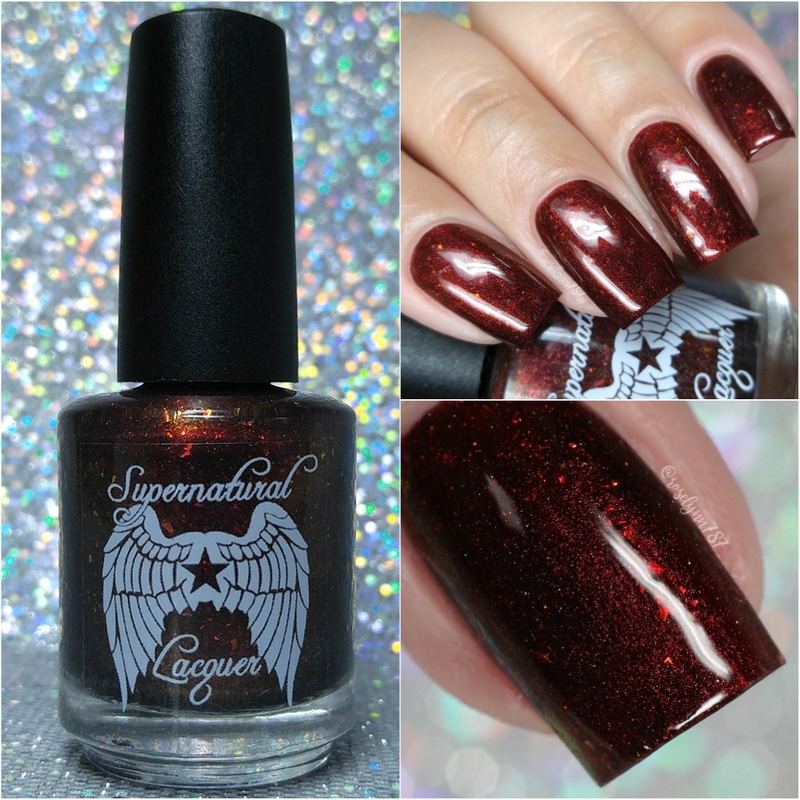 Now onto more happiness from one of my favorite brands... Today I'm sharing swatches for Mercury in Retrograde by Supernatural Lacquer, which is the April contribution to the Polish Pickup Collaboration. If you're into vampy deliciousness then this is the shade for you! I'll let the photos do the convincing, let's go ahead and get right to it. Mercury in Retrograde by Supernatural Lacquer will be available for purchase through the Polish Pickup Shop Friday, April 6th at 11AM EST through April 9th. The full-size 15mL shade will retail for $11.50 each and there is a generous cap this month at 250 bottles. If you're not familiar with the concept, the Polish Pickup offers a fun, interactive experience that allows you to submit theme ideas, vote for your favorite theme, and selectively purchase your favorite polishes every month. As I mentioned before, the theme that was voted for April is Across the Universe. This month Stefanie found her inspiration from a photo of planet Mercury. 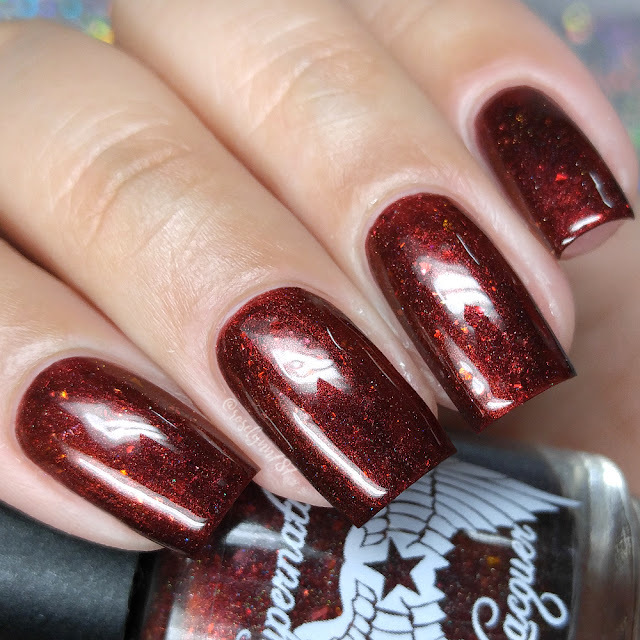 Mercury in Retrograde can be described as a deep, almost blood red base with red/orange/gold multichrome shimmer, red-orange ultra chameleon chrome flakes, orange-red-gold color shifting flakes and a touch of scattered holo. 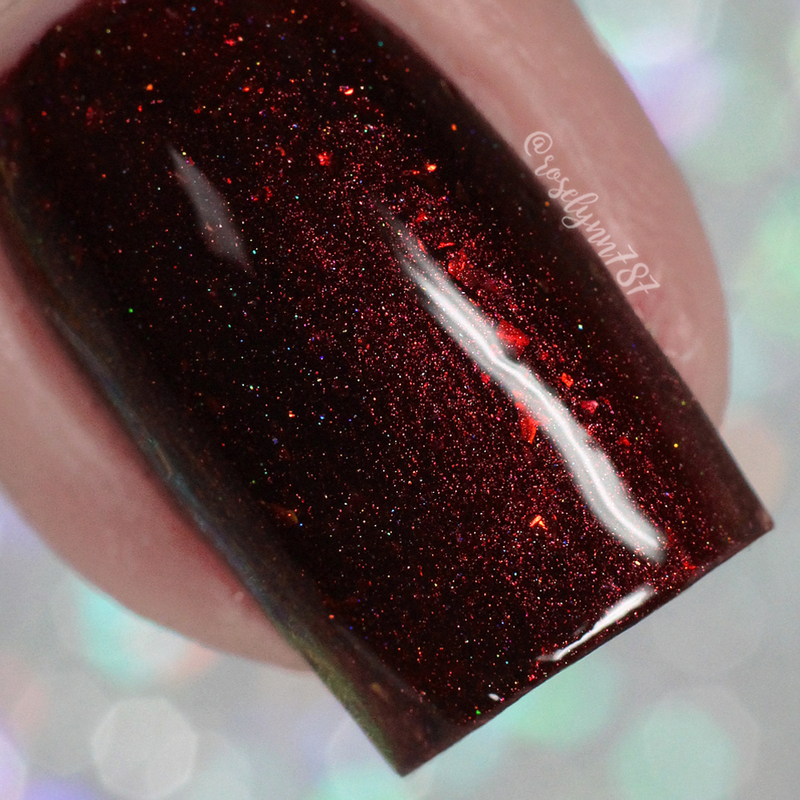 I may or may not have drooled when I swatched this polish... okay I definitely did, haha. To say it's gorgeous feels like an understatement. The glowy vibe of the planet inspiration is perfectly captured in the shimmer and flakes. Everything works so well together and doesn't look too busy or cluttered. Instead everything looks seamless with so much depth and sparkle. Plus you can never truly go wrong with a vampy red. It looks great against any skin complexion, any day or time. The formula has a really nice and opaque application, though not a one coater. It has smooth and easy layering for full coverage with each layer having ample flakes. There is no clumping with the flakes and they all lie perfectly flat on the nail. The consistency is well balanced and doesn't feel too thick or too thin. It dries down to a smooth and very high-shine finish on its own. I did experience some very minimal staining on removal to my cuticles, but none to my actual nail beds. It wasn't long lasting and I found it easy to remove with some extra cleaning. Shown here in two coats and sealed with a glossy topcoat. 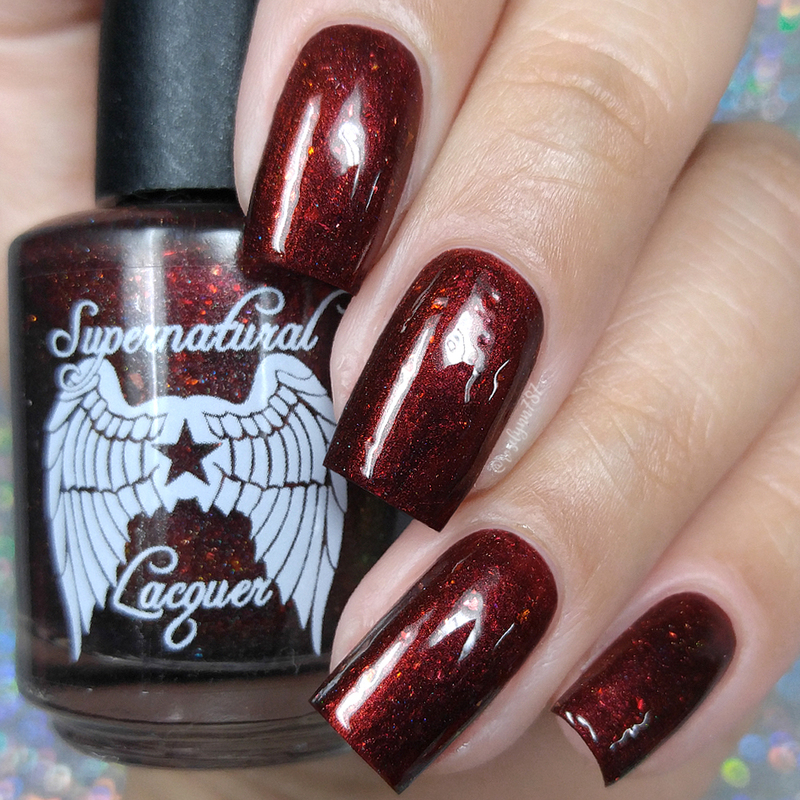 To recap, Mercury in Retrograde by Supernatural Lacquer will be available for purchase through the Polish Pickup Shop Friday, April 6th at 11AM EST through April 9th. 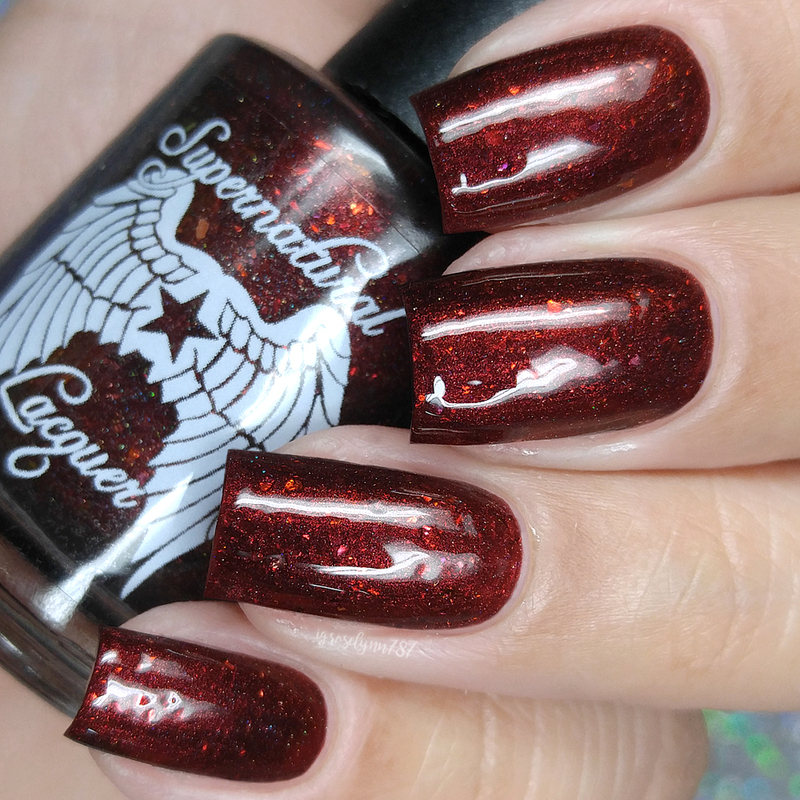 The full-size 15mL shade will retail for $11.50 each and there is a generous cap this month at 250 bottles.